The term “reverse wedding” has been thrown around a lot lately, and for good reason. This new wedding trend mixes up the traditional day-of schedule by having the reception (AKA the par-tay!) first and the ceremony at the end. This is perfect for the non-traditional bride who wants her big day to be more of a celebration and dance party than anything else. While these reverse weddings are amazingly fun, they are still unconventional enough that you won’t find too many helpful guides on how to have one. We’re here to show you how to pull it off, step by step. With the tips below, everyone will be talking about your celebration for years to come. 1. Clue everyone in… repeatedly. Reverse weddings are SO different from the norm that you are going to have to explain the concept to people a few times. Make this easy on yourself by including little reminders during your engagement events that people can easily refer to. You can spell it out on your save the dates, your wedding website or your wedding Facebook group page. Make sure a few key people, like your bridal party and your parents, know exactly what the plan is so they can explain it to any other guests who have questions in the run-up to the wedding. 2. Have a countdown. Think of New Year’s Eve – the countdown keeps the momentum of the night going and builds anticipation. You want the same effect for your reverse wedding. A big clock in a central space is the easiest way to do this, but you could also have hourly chimes, or even have your bridal party speeches every hour on the hour. This keeps the night moving, encourages your guests to keep their energy up and pace themselves. 3. Space out the refreshments. 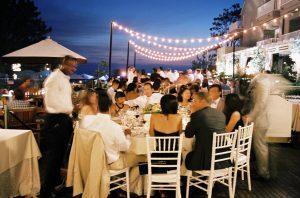 Sit-down dinners don’t go too well with reverse weddings, where the whole idea is to party! Buffets aren’t great either ’cause nobody wants to go touch that ahi sashimi after it’s been sitting out for over an hour. Instead, stick to heavy apps so your guests don’t get too weighed down, but remember to space the food out in a logical order. Start with traditional apps, then move on to heavier apps and finish with bite-size desserts. This is a sequence that everyone can follow and will keep the evening moving in an order that feels natural and comfortable. 4. Get specific with the music. Music is an even bigger deal at a reverse wedding than a traditional one, especially since a moment of dead air could kill the party vibe. Keep your music curated but also transitional throughout the evening. Lounge-y tunes during the arrivals facilitates conversation and can be increased in energy while the food part of the night starts. From there everyone should be ready to get loose on the dance floor for a while. And when it’s time to wind down into the ceremony, you can scale it back to whatever vibe you want as a background for your I Do’s. 5. Run wild with outfit changes. If you can’t contain yourself to one wedding outfit, this is your chance to go for broke. Since the couple is the focal point of the night, an easy way to signal transitions is through outfit changes. You can start the evening in a fun romper while everyone is arriving, change into a killer cocktail dress for food and dancing and finish the night off in your spectacular wedding dress! The outfit changes are a great way to signal the next part of the evening AND will let you be comfortable throughout – no train or heavy dress to worry about wearing for hours. 6. Put the mood in mood lighting. This trick is so simple and so effective that it’s a mainstay of weddings now, but it’s never been more appropriate than at a reverse wedding. Use mood lighting to put everyone in the right mood for every part of the night. For arrivals, soft amber or rose light makes everyone look fantastic. Let it get darker for the dancing so everyone can dance like nobody’s watching. Then slowly bring the lights back to a warm candlelight effect for your ceremony. Even the tears in everyone’s eyes will look better. 7. Cut off the alcohol early. Nobody wants the party to get out of hand, so make last call about an hour before the ceremony. This will help stave off over-indulging and also signal to everyone that things are about to get a little more serious. It is time for the vows, after all! If you don’t want to cut it off entirely, try switching to just beer and wine so people can still enjoy themselves, responsibly, of course. 8. Exit immediately from the ceremony. By the time the ceremony is over, everyone should be well-fed, danced out and ready to head back to bed (or at least an impromptu after party at the hotel). Make your exit immediately from the ceremony so everyone knows they can go too. Then you can settle back and enjoy hearing about how awesome your reverse wedding was for years to come! Interested in having a reverse wedding?